Looking for movie tickets? 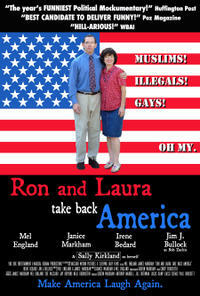 Enter your location to see which movie theaters are playing Ron and Laura Take Back America near you. In the mockumentary, Ron and Laura Grawsill are taking America back! But, when they decide to film their protests against Obamacare and Gay Marriage, the “culture wars” land right in their own backyard.